Over the past year, enrollment in the Conservation Reserve Program’s CP42 – Pollinator Practice has taken off. This was due in part to the growing interest in monarch butterflies and also the low acceptance rates for general CRP offers in the most recent signup. 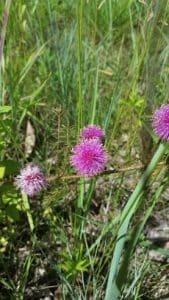 In Shelby County and many others, this means that we now have landowners that are destroying old cool season grass CRP seedings to plant native wildflowers. While this is great for wildlife, these mixes present unique challenges to landowners looking to establish them. When compared to the methods used to establish grass plantings, the methods for wildflower establishment appear foreign at best and like a farce at worst. We connected with many of those landowners that day, and I learned something. I learned that true partnership happens at the level of the individual. It happens when we find the strength to ask how we can help each other. It happens when we look past ourselves and work together to make a better today. For that I thank my partners. Thanks to Jarrell Foreman, Farm Service Agency. Thank you, Jamie Ebbesmeyer and Ted Sieler, MDC PLCs. Thank you, Mitch Krueger, NRCS. Thank you, Jason Sykes, MDC AB. Thank you, Ryan Diener, QF Farm Bill Biologist. Thank you, Mark Twain Chapter of Quail Forever. Thank you to all those in leadership who no longer work in the field, who without a doubt made this possible. Thank you, Jerry Boehmer for the great work you do on your farm and for letting us share that with others. Thanks to all the landowners that attended. You made a difference that I will not forget.